I didn’t call the Beatles by their first names – or even clearly know their names – when they first came to America. Although the media wouldn’t let you forget Beatlemania, I was more of the Beach Boys persuasion at the time, and later got caught up in the San Francisco sound. 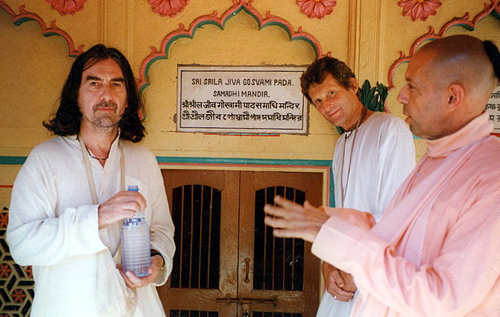 Then, in 1968, the Beatles did something amazing to me – they went to India to study with a guru. They opened a door I had only vaguely known was there. 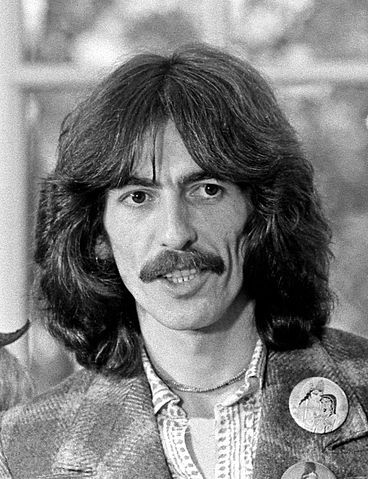 George was the Beatle whose life and work were forever altered by eastern religion, as was my own. He learned to play the sitar with a master, while I learned the harmonium, (a wonderfully simple instrument that allows even a novice to produce a credible melody). For a time he belonged to an organization I did, dedicated to meditation and the study of eastern philosophy. In Vrindavan, India, 1996. Public Domain. Here is a very nice clip on one of my favorite George Harrison songs from the Concert for Bangladesh, 1971. On this day, when I listen to his music, I remember a man I truly admire, who was genuine, who found his own path and followed it to the best of his ability. “You got to walk that lonesome valley by yourself,” as the old song says, but we do not do so alone. Somehow the spirits of those who went before are there to inspire us. This entry was posted in Culture, Music, Spirituality and tagged Culture, George Harrison, Music, spirituality. Bookmark the permalink. Very nice post. Thanks for the music and the history. Glad you enjoyed the post and music. I like your take of Harrison’s spiritual journey. Although I disagree with the theology of his belief system, he was genuine and believe him to be a decent man. Yes, he was sincere and genuine. Not an easy task at all with that kind of money and celebrity. you know, it is not fair to compare one of the beatles to any other, but there was always something about george that drew me to him. he seemed to embody such an inner peace and contentment, and i think this came apparent as he never seemed to be reaching for a post-beatle spotlight, even after being the least glamorous of the beatles. there was always a gentleness about him that was transcendent. nice tribute.